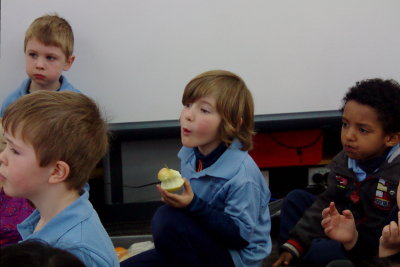 It is important to Ainslie's school community that the children have the best nutrition possible to ensure their health and wellbeing. Good nutrition can help children to build healthy bodies and minds, stay alert in class and be energetic all day, maintain a healthy weight and fight infections. Ainslie School promotes a variety of programs for the children to learn how to grow, harvest, prepare and share fresh food and drink fresh water in the belief that this approach will provide a better chance of positively influencing children's food choices. Help your children to get the most out of life by eating healthy foods from the 5 different food groups. Explore this website link to find information and ideas on healthy lunchbox ideas for kids. Ainslie School has been one of the first schools in the local area to install fresh water refill stations. As part of this project all Ainslie students from Kindergarten to year 6 received a refillable drink bottle. This initiative encourages students to drink tap water frequently and reduces the use of disposable water containers.